While I am not possessed by a demon there are certainly times when I am plagued with partial belief as the man in the story is. It seems no matter how hard I try to hold on to “Anything is possible for someone who has faith” I slip on my faith and fall. Sometimes the fall isn’t so painful and other times it is. The lesson I am learning is to depend on Jesus’ faith and not my own. But like a lot of things what seems so easy to say isn’t so easy to carry out. Perhaps like me you’ve tripped over your faith, if so let the words of this prayer pick us up and send us on our way to greater and more deeper faith and belief not in prayer alone but also in the one to whom we pray. Heavenly Father… My faith is not working! The faith I need is the super-natural faith of Jesus. I know in many ways I am not worthy of such a wonderful blessing and so in my imagination I will make the journey to the cross and throw myself at his feet and ask for your hand of Forgiveness and your heart of Grace. It is my hearts desire LORD to bring glory to you. I love you God! I love you Jesus. I love you my Friend the Holy Spirit! 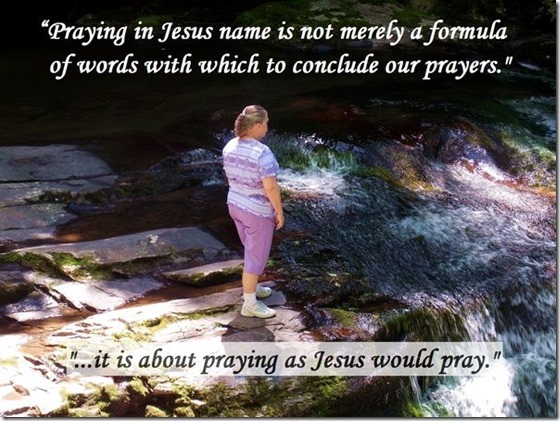 In the Beloved name of Jesus I pray. Amen!